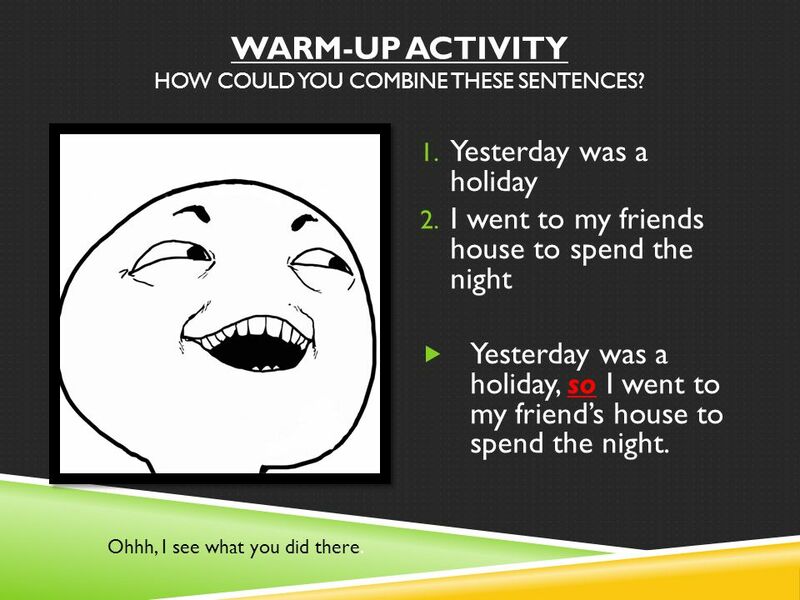 2 Warm-Up: How could you combine the following sentences? 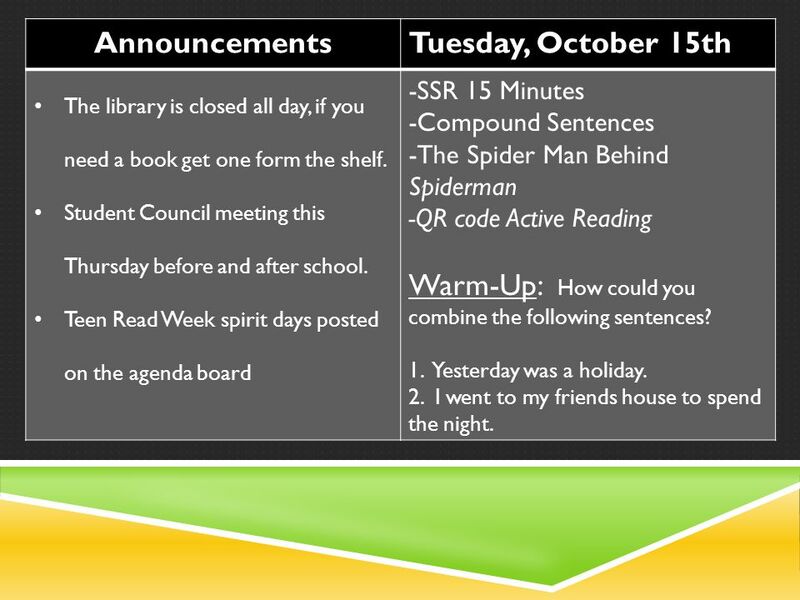 Announcements Tuesday, October 15th The library is closed all day, if you need a book get one form the shelf. Student Council meeting this Thursday before and after school. 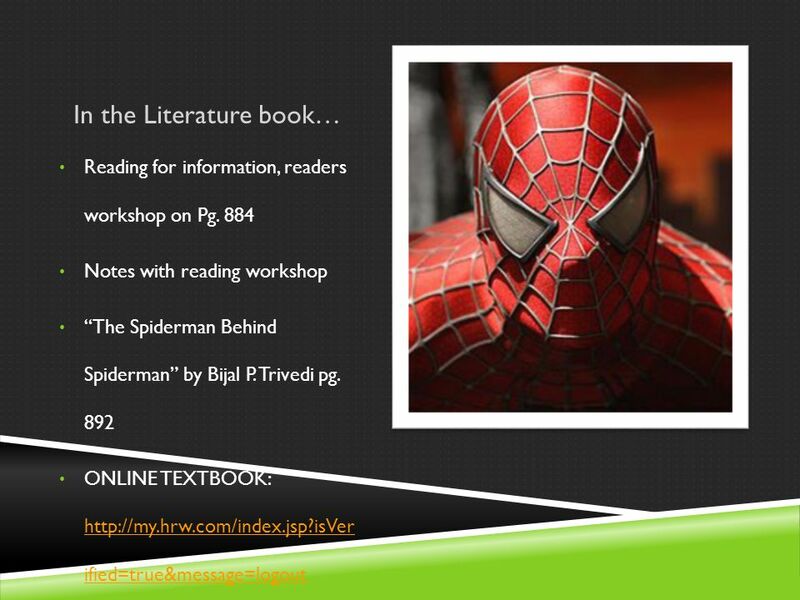 Teen Read Week spirit days posted on the agenda board -SSR 15 Minutes -Compound Sentences -The Spider Man Behind Spiderman -QR code Active Reading Warm-Up: How could you combine the following sentences? 1. Yesterday was a holiday. 2. I went to my friends house to spend the night. 3 Warm-Up Activity How could you combine these sentences? Yesterday was a holiday I went to my friends house to spend the night Yesterday was a holiday, so I went to my friend’s house to spend the night. Ohhh, I see what you did there. 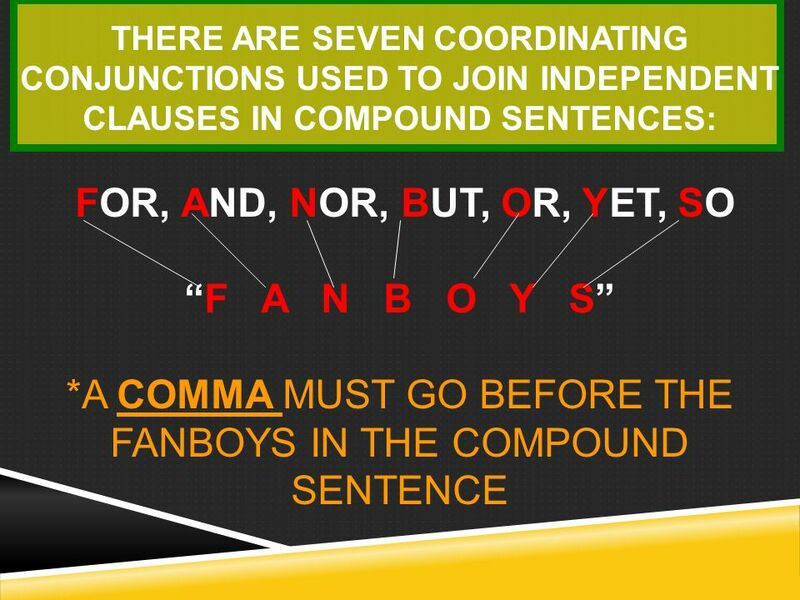 6 *A comma must go before the FANBOYS in a compound sentence. 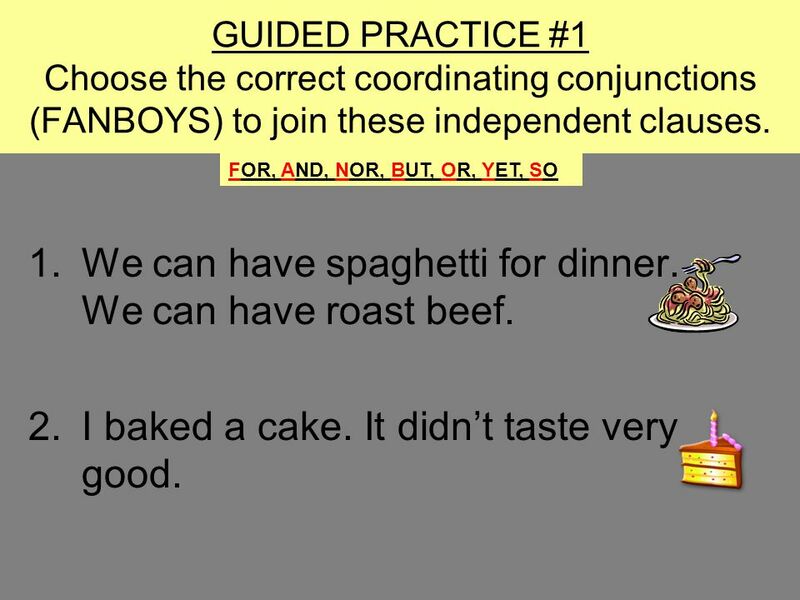 There are seven coordinating conjunctions used to join independent clauses in compound sentences: FOR, AND, NOR, BUT, OR, YET, SO a.k.a. 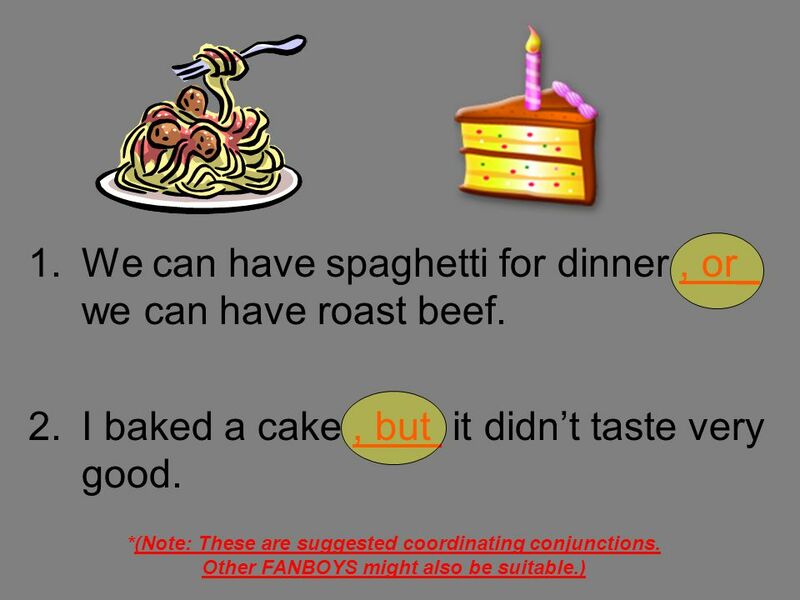 “F A N B O Y S” *A comma must go before the FANBOYS in a compound sentence. 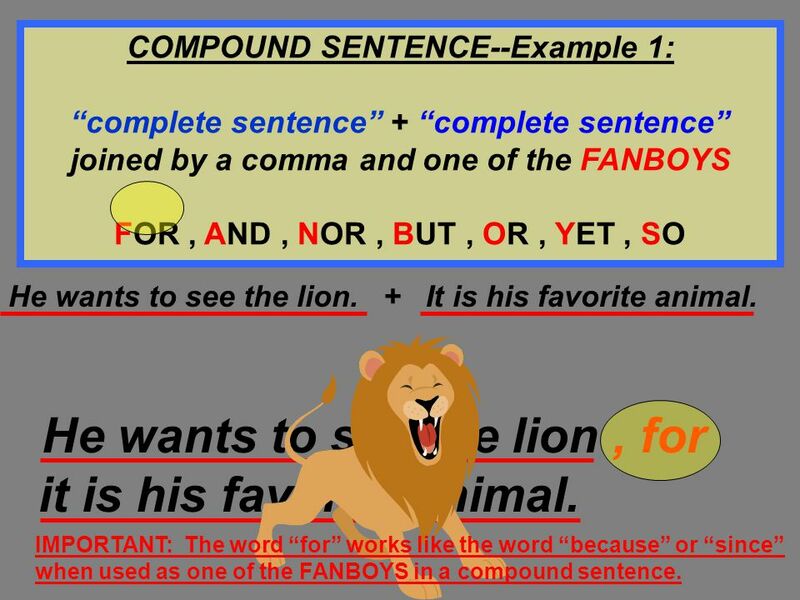 “complete sentence” + “complete sentence” joined by a comma and one of the FANBOYS FOR , AND , NOR , BUT , OR , YET , SO He wants to see the lion It is his favorite animal. He wants to see the lion , for it is his favorite animal. IMPORTANT: The word “for” works like the word “because” or “since” when used as one of the FANBOYS in a compound sentence. 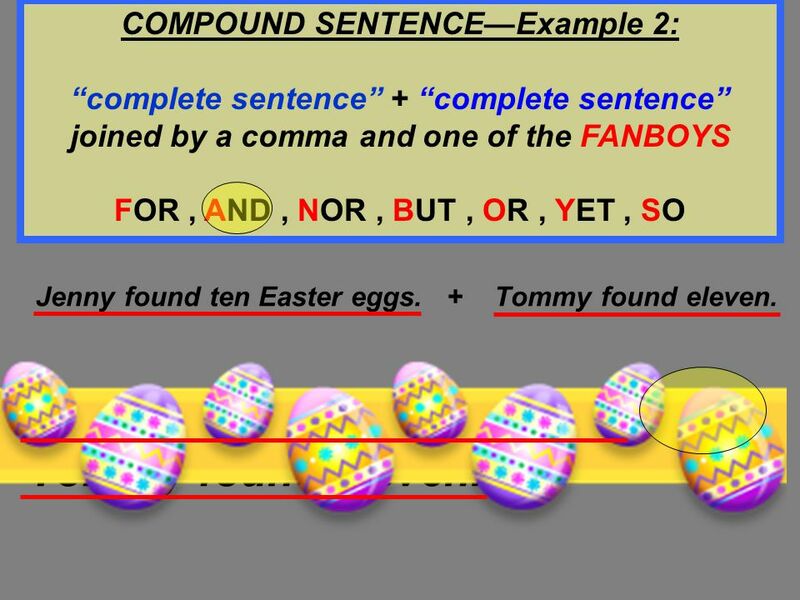 “complete sentence” + “complete sentence” joined by a comma and one of the FANBOYS FOR , AND , NOR , BUT , OR , YET , SO Jenny found ten Easter eggs Tommy found eleven. Jenny found ten Easter eggs , and Tommy found eleven. 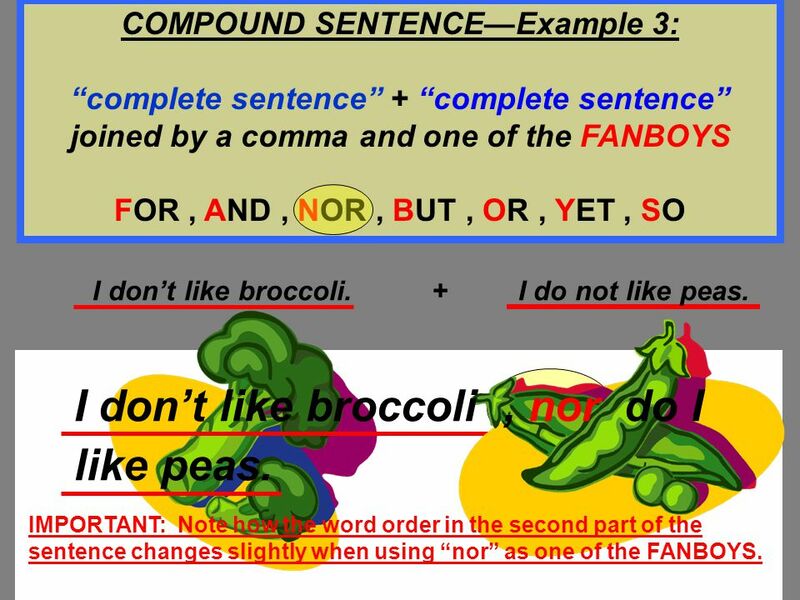 “complete sentence” + “complete sentence” joined by a comma and one of the FANBOYS FOR , AND , NOR , BUT , OR , YET , SO I don’t like broccoli I do not like peas. I don’t like broccoli , nor do I like peas. IMPORTANT: Note how the word order in the second part of the sentence changes slightly when using “nor” as one of the FANBOYS. 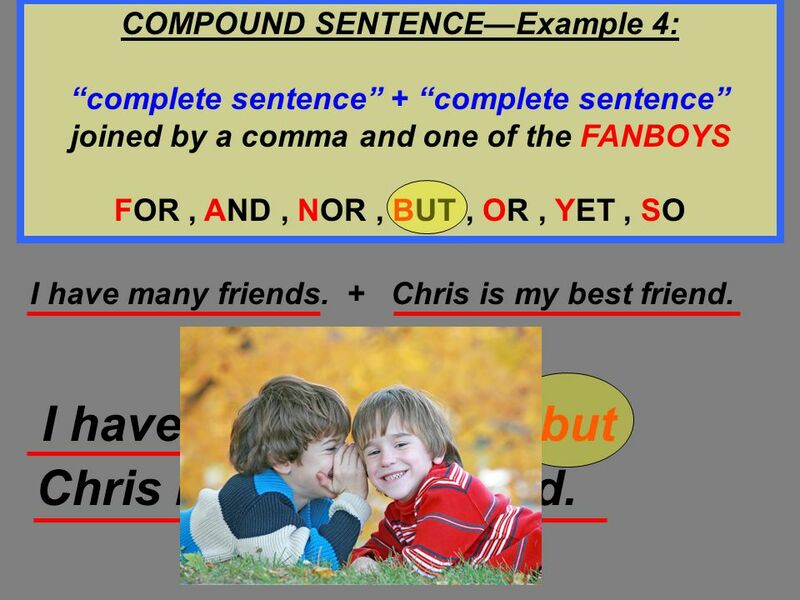 “complete sentence” + “complete sentence” joined by a comma and one of the FANBOYS FOR , AND , NOR , BUT , OR , YET , SO I have many friends Chris is my best friend. I have many friends , but Chris is my best friend. 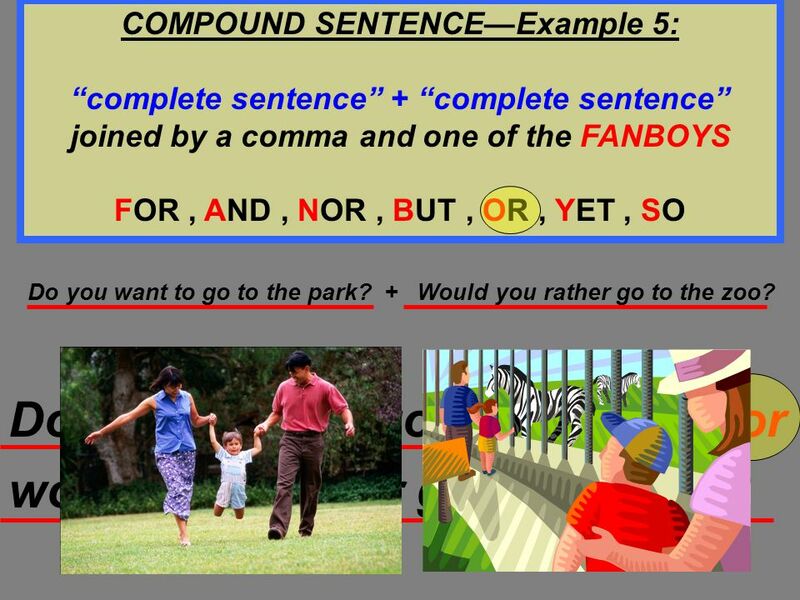 “complete sentence” + “complete sentence” joined by a comma and one of the FANBOYS FOR , AND , NOR , BUT , OR , YET , SO Do you want to go to the park? + Would you rather go to the zoo? Do you want to go to the park , or would you rather go to the zoo? 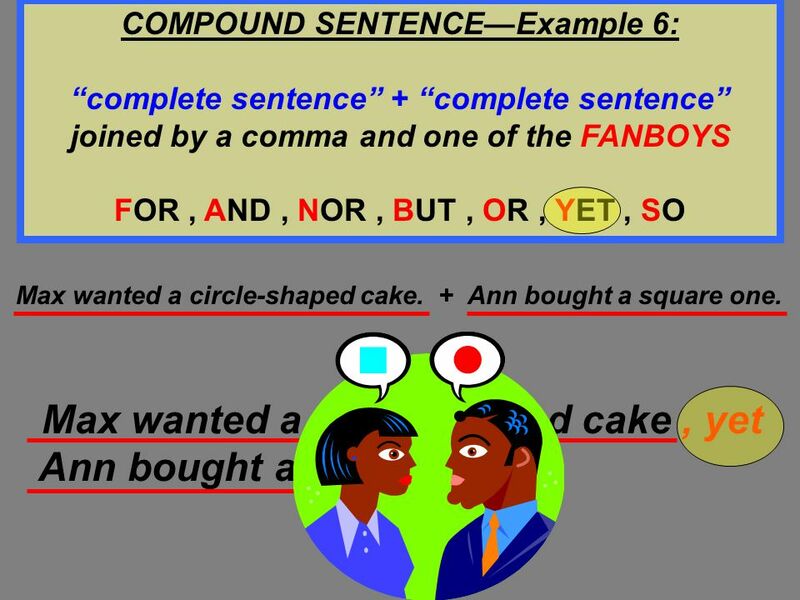 “complete sentence” + “complete sentence” joined by a comma and one of the FANBOYS FOR , AND , NOR , BUT , OR , YET , SO Max wanted a circle-shaped cake. + Ann bought a square one. Max wanted a circle-shaped cake , yet Ann bought a square one. 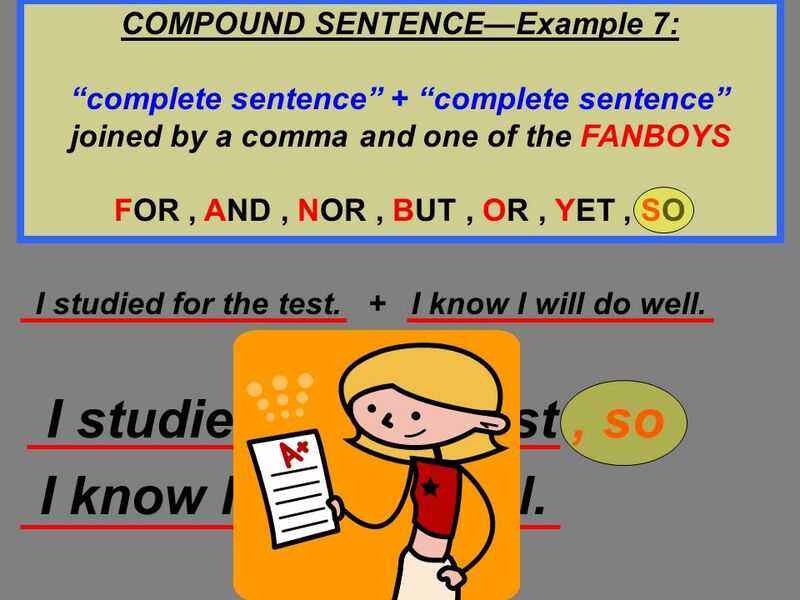 “complete sentence” + “complete sentence” joined by a comma and one of the FANBOYS FOR , AND , NOR , BUT , OR , YET , SO I studied for the test I know I will do well. I studied for the test , so I know I will do well. 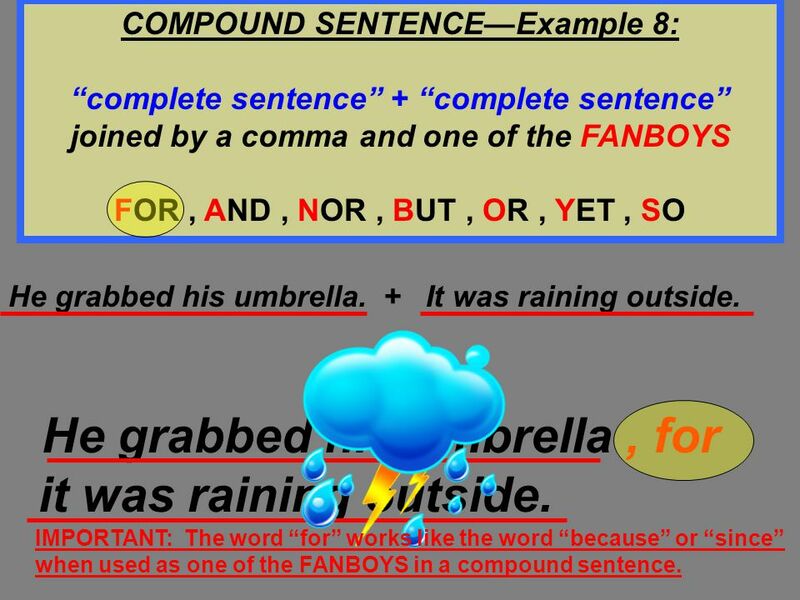 “complete sentence” + “complete sentence” joined by a comma and one of the FANBOYS FOR , AND , NOR , BUT , OR , YET , SO He grabbed his umbrella It was raining outside. He grabbed his umbrella , for it was raining outside. IMPORTANT: The word “for” works like the word “because” or “since” when used as one of the FANBOYS in a compound sentence. 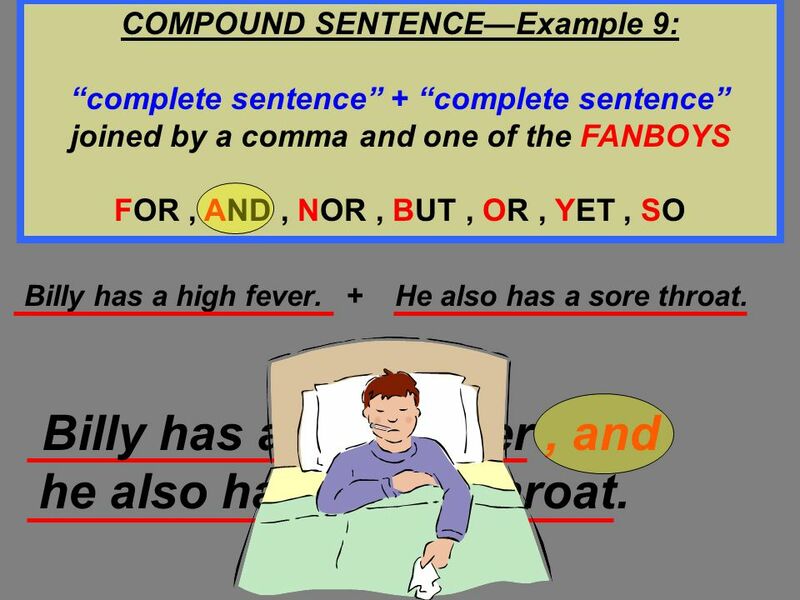 “complete sentence” + “complete sentence” joined by a comma and one of the FANBOYS FOR , AND , NOR , BUT , OR , YET , SO Billy has a high fever He also has a sore throat. Billy has a high fever , and he also has a sore throat. 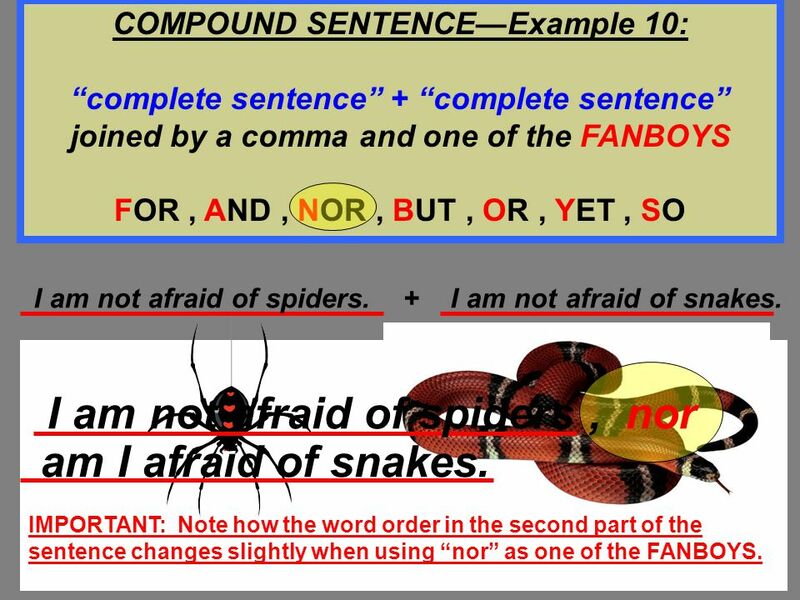 “complete sentence” + “complete sentence” joined by a comma and one of the FANBOYS FOR , AND , NOR , BUT , OR , YET , SO I am not afraid of spiders I am not afraid of snakes. I am not afraid of spiders , nor am I afraid of snakes. IMPORTANT: Note how the word order in the second part of the sentence changes slightly when using “nor” as one of the FANBOYS. 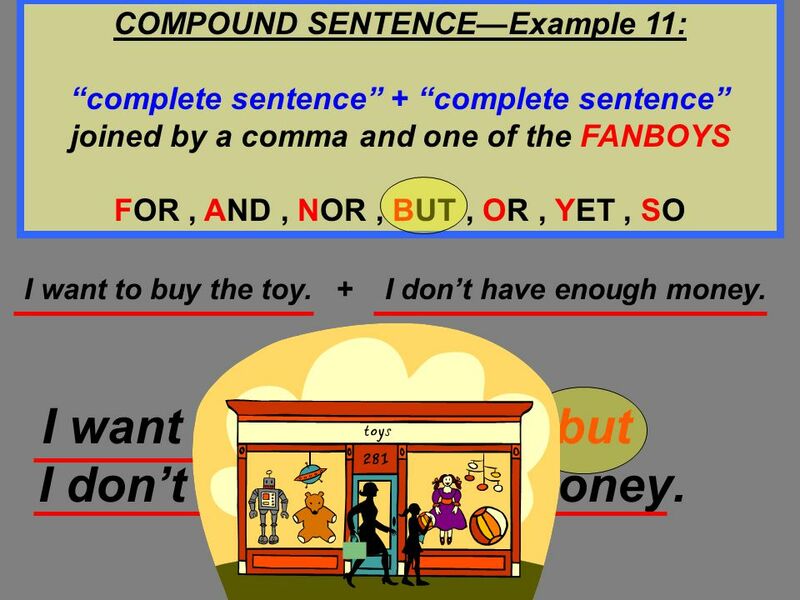 “complete sentence” + “complete sentence” joined by a comma and one of the FANBOYS FOR , AND , NOR , BUT , OR , YET , SO I want to buy the toy I don’t have enough money. I want to buy the toy , but I don’t have enough money. 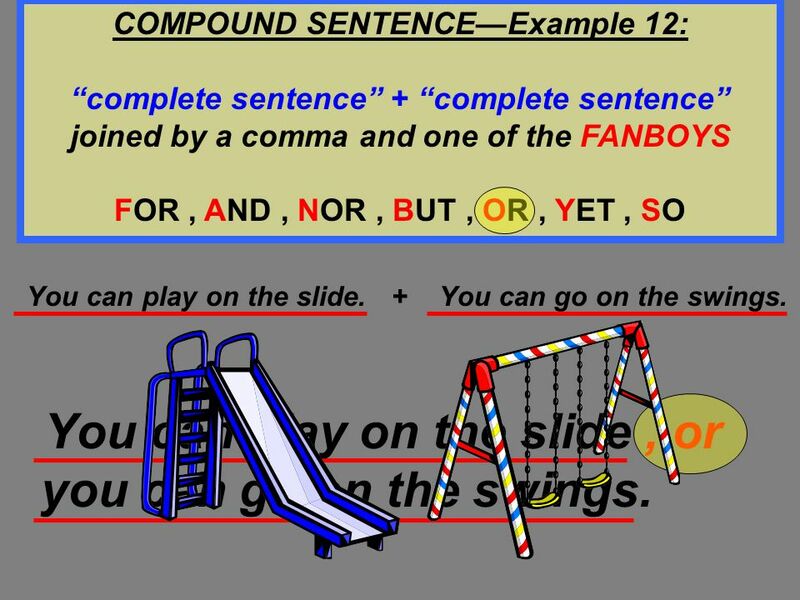 “complete sentence” + “complete sentence” joined by a comma and one of the FANBOYS FOR , AND , NOR , BUT , OR , YET , SO You can play on the slide You can go on the swings. You can play on the slide , or you can go on the swings. 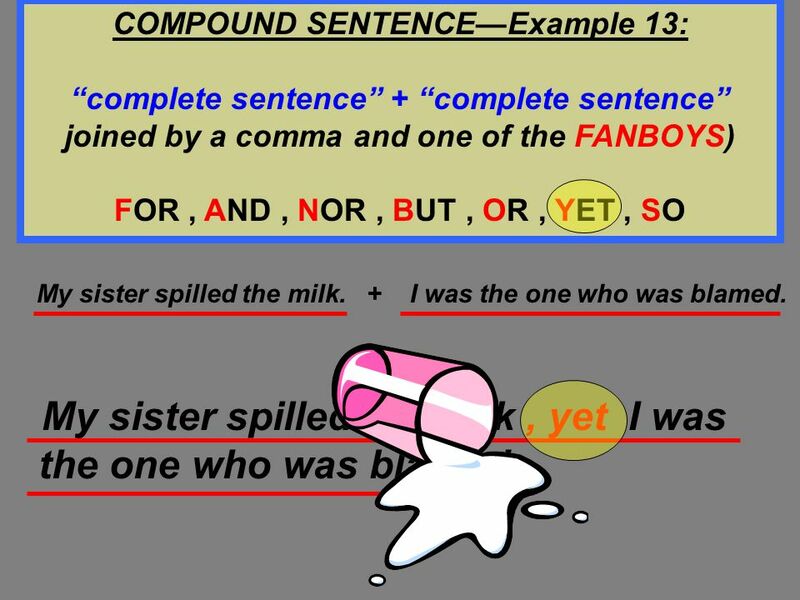 “complete sentence” + “complete sentence” joined by a comma and one of the FANBOYS) FOR , AND , NOR , BUT , OR , YET , SO My sister spilled the milk I was the one who was blamed. My sister spilled the milk , yet I was the one who was blamed. 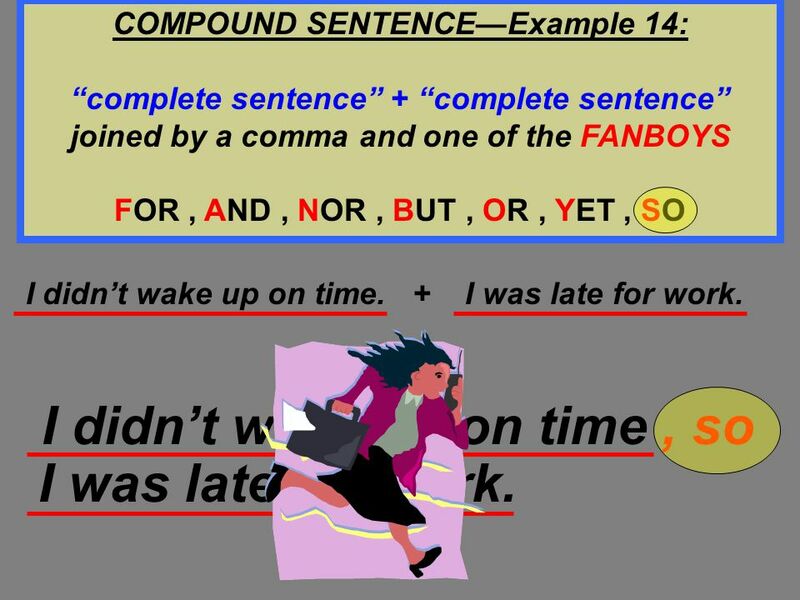 “complete sentence” + “complete sentence” joined by a comma and one of the FANBOYS FOR , AND , NOR , BUT , OR , YET , SO I didn’t wake up on time I was late for work. I didn’t wake up on time , so I was late for work. 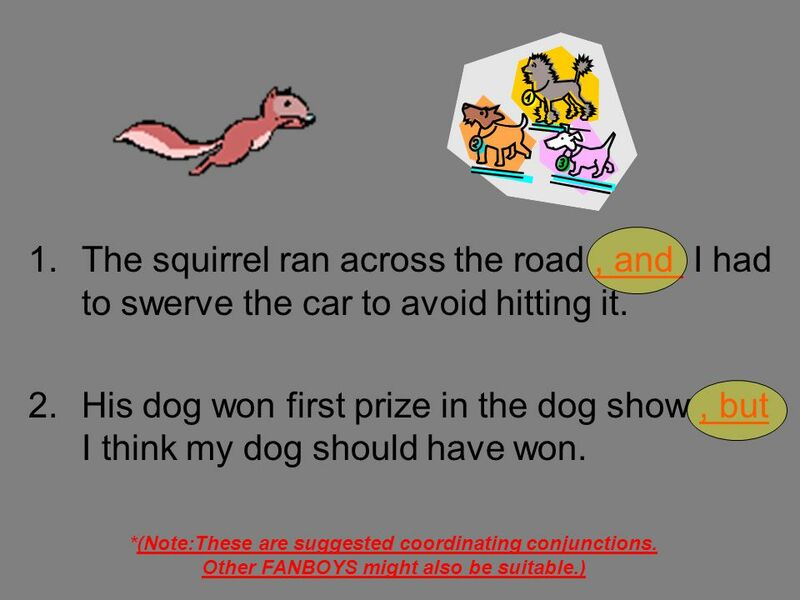 24 GUIDED PRACTICE #1 Choose the correct coordinating conjunctions (FANBOYS) to join these independent clauses. FOR, AND, NOR, BUT, OR, YET, SO The squirrel ran across the road. I had to swerve the car to avoid hitting it. His dog won first prize in the dog show. I think my dog should have won. 25 The squirrel ran across the road , and I had to swerve the car to avoid hitting it. 26 We can have spaghetti for dinner. We can have roast beef. 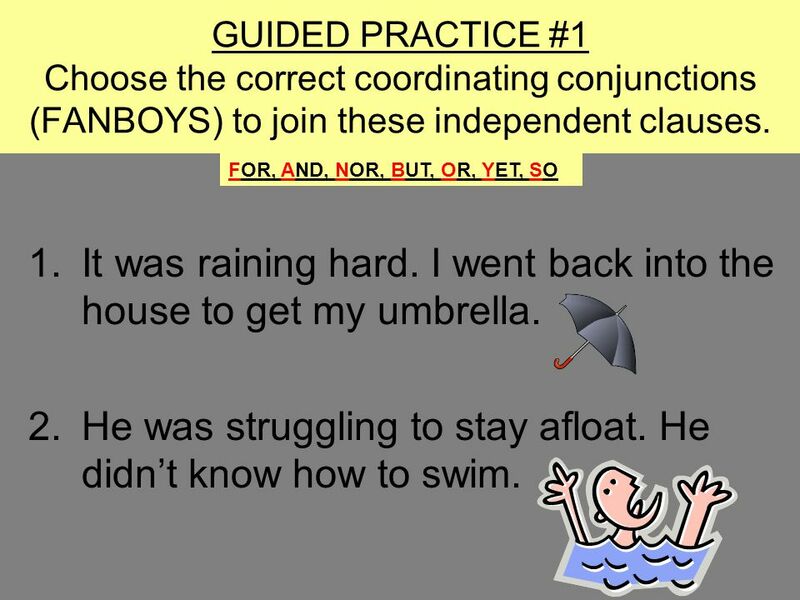 GUIDED PRACTICE #1 Choose the correct coordinating conjunctions (FANBOYS) to join these independent clauses. FOR, AND, NOR, BUT, OR, YET, SO We can have spaghetti for dinner We can have roast beef. I baked a cake. It didn’t taste very good. 27 We can have spaghetti for dinner , or_ we can have roast beef. 28 It was raining hard. I went back into the house to get my umbrella. 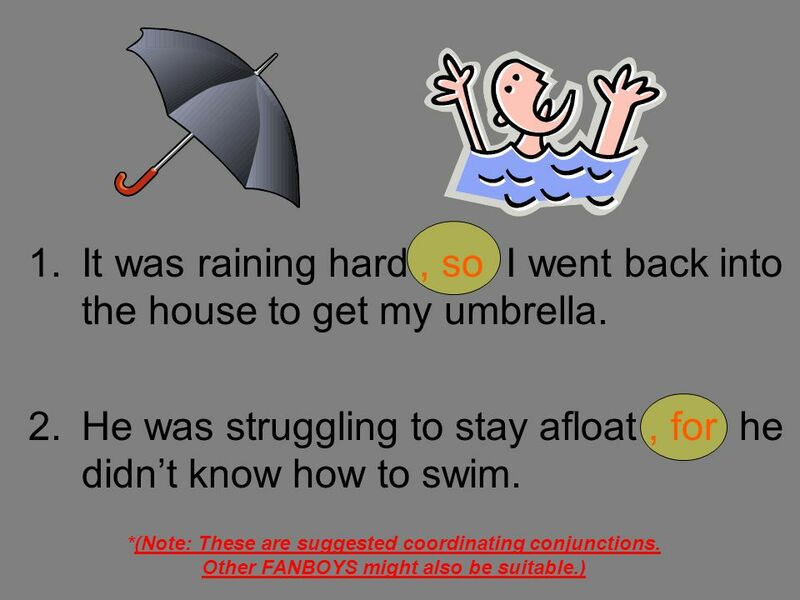 GUIDED PRACTICE #1 Choose the correct coordinating conjunctions (FANBOYS) to join these independent clauses. FOR, AND, NOR, BUT, OR, YET, SO It was raining hard. I went back into the house to get my umbrella. He was struggling to stay afloat. He didn’t know how to swim. 29 He was struggling to stay afloat , for he didn’t know how to swim. 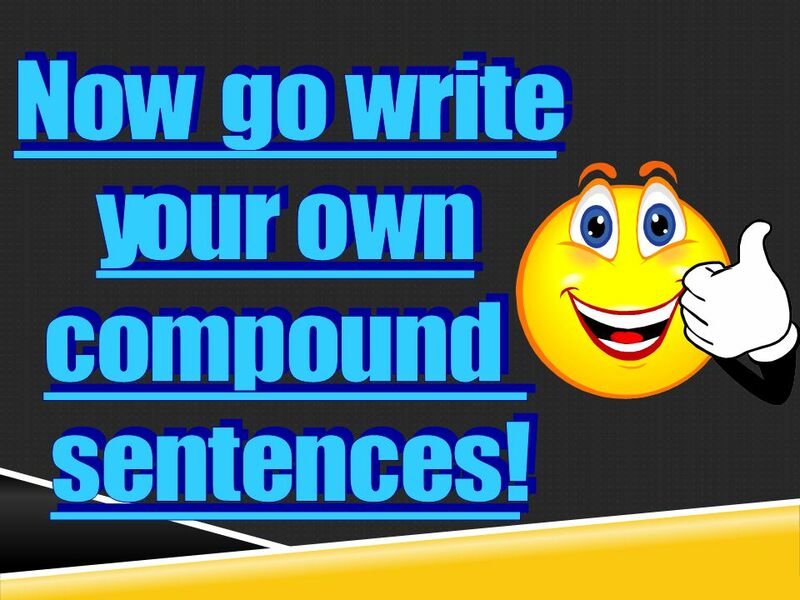 30 GUIDED PRACTICE #2 Determine whether or not the sentences are compound sentences. (2 independent clauses joined by a coordinating conjunction) FOR, AND, NOR, BUT, OR, YET, SO Marty is my best friend, and we have lots of fun together. 2. I brought an apple for the teacher this morning. 3. I don’t know what I’m going to do about that yet. She likes all school subjects, but her favorite is math. ***The sentence has 2 independent clauses joined by a comma and one of the FANBOYS. 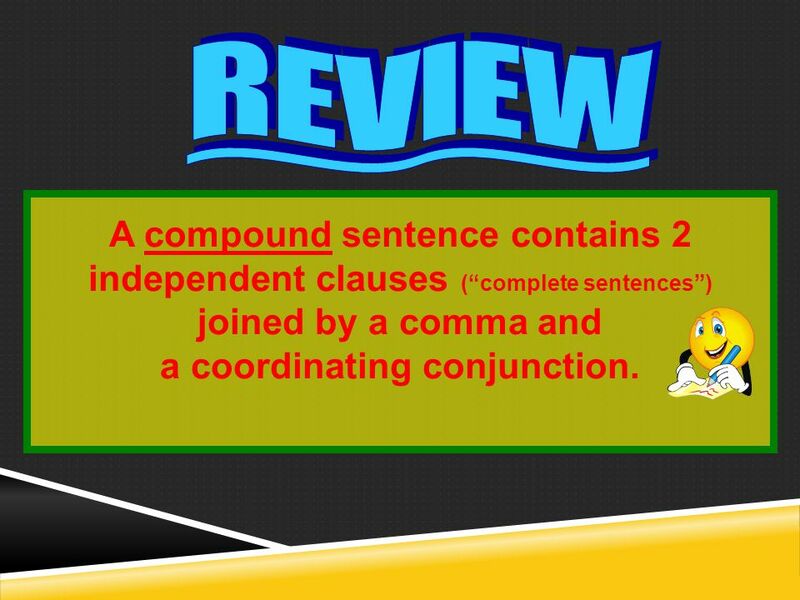 ***The sentence does not have 2 independent clauses. 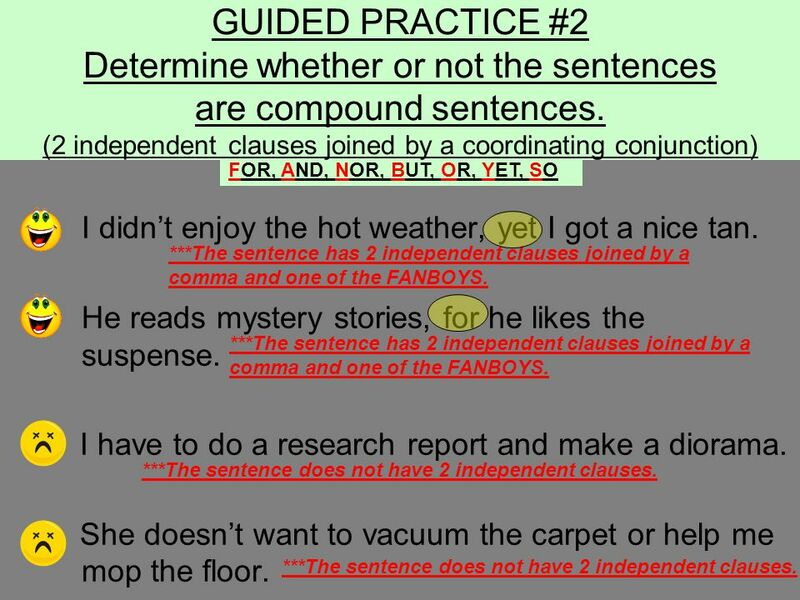 ***The sentence does not have 2 independent clauses. ***The sentence has 2 independent clauses joined by a comma and one of the FANBOYS. 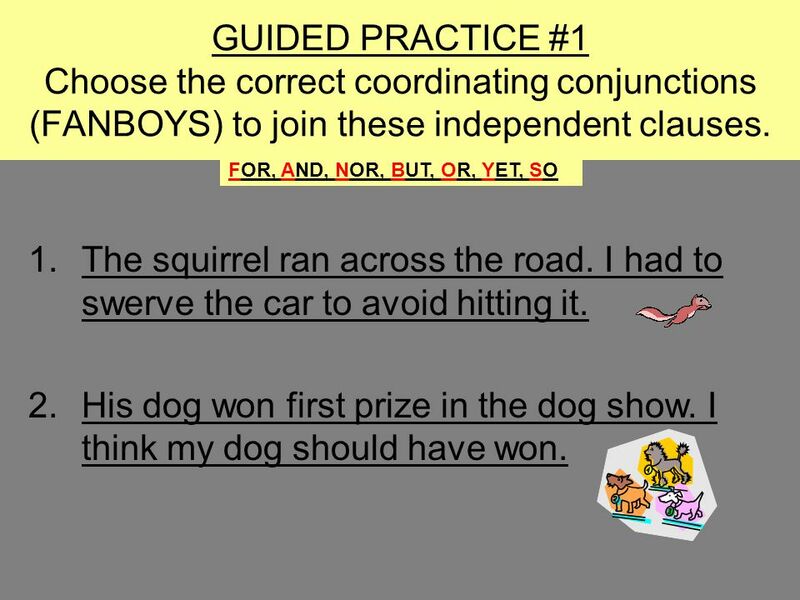 31 GUIDED PRACTICE #2 Determine whether or not the sentences are compound sentences. (2 independent clauses joined by a coordinating conjunction) FOR, AND, NOR, BUT, OR, YET, SO He will take a nap in the bedroom or on the couch. I spent all my money on toys, so I don’t have enough to buy candy. 3. He wants to lose weight, yet he refuses to exercise. 4. She hates chopping onions because it makes her cry. ***The sentence does not have 2 independent clauses. ***The sentence has 2 independent clauses joined by a comma and one of the FANBOYS. 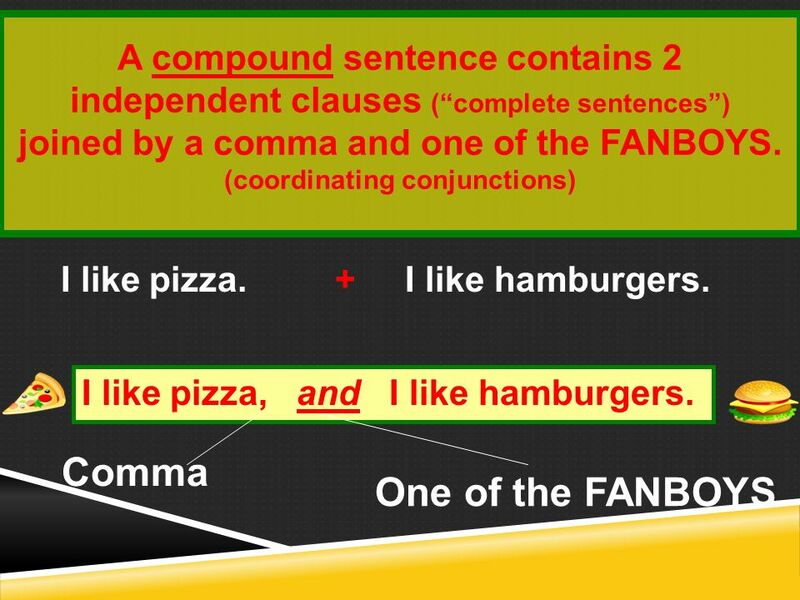 ***The sentence has 2 independent clauses joined by a comma and one of the FANBOYS. 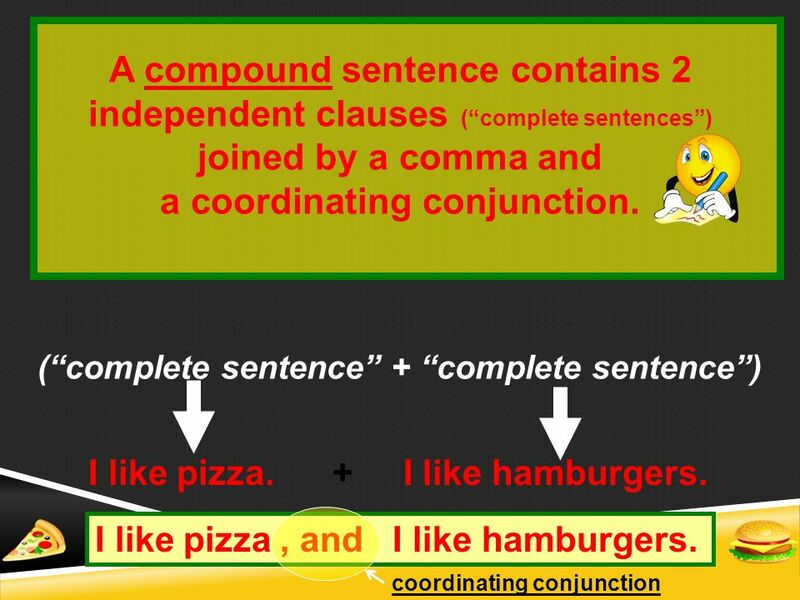 ***The sentence does not have a coordinating conjunction. The word “because” is a SUBORDINATING conjunction, not a COORDINATING conjunction. It is NOT one of the FANBOYS. 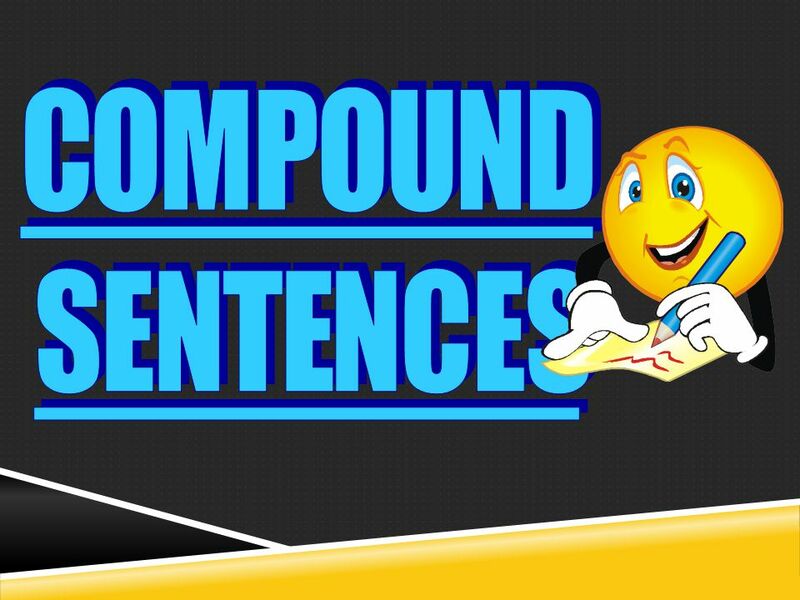 32 GUIDED PRACTICE #2 Determine whether or not the sentences are compound sentences. (2 independent clauses joined by a coordinating conjunction) FOR, AND, NOR, BUT, OR, YET, SO I didn’t enjoy the hot weather, yet I got a nice tan. He reads mystery stories, for he likes the suspense. 3. I have to do a research report and make a diorama. 4. She doesn’t want to vacuum the carpet or help me mop the floor. ***The sentence has 2 independent clauses joined by a comma and one of the FANBOYS. ***The sentence has 2 independent clauses joined by a comma and one of the FANBOYS. ***The sentence does not have 2 independent clauses. ***The sentence does not have 2 independent clauses. 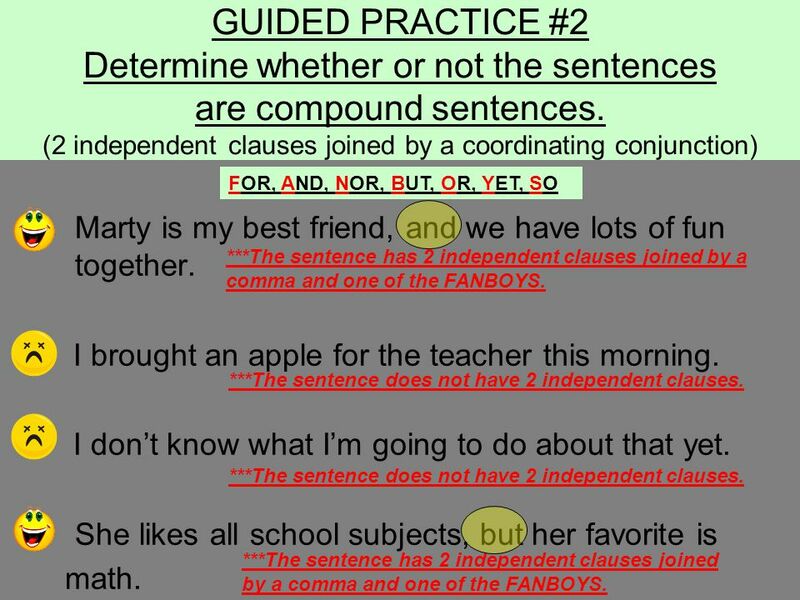 33 GUIDED PRACTICE #3 Add an independent clause after each of the FANBOYS below to create a compound sentence. I used to think he was honest, but_____________. He was making the dog angry, and____________. 3. They better not make a mess, or______________. 4. She didn’t hear me, for______________________. 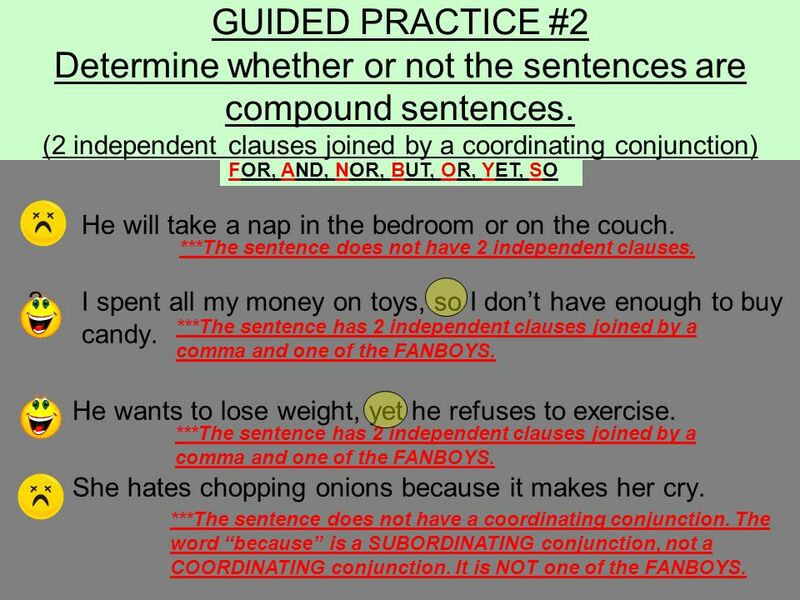 34 GUIDED PRACTICE #3 Add an independent clause after each of the FANBOYS below to create a compound sentence. He practices his trumpet everyday, yet_________. She wanted to learn to dance, so______________. 3. I don’t like pizza, nor _______________________. 4. We watered the plant daily, but_______________. 35 R E V I E W A compound sentence contains 2 independent clauses (“complete sentences”) joined by a comma and a coordinating conjunction. 37 N o w g o w r i t e yo u r o w n c o m p o u n d s e n t e n c e s ! 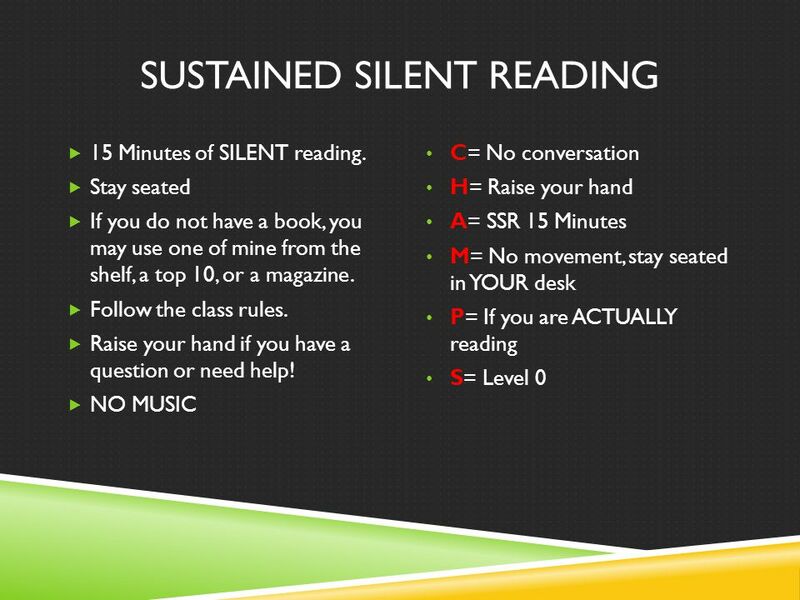 Download ppt "Sustained Silent Reading"
Warm Up In at least three complete sentences, explain the importance of using coordinating conjunctions in your writing. Fragments and Run ons Ms. López March 7th, 2012. Subject-Predicate & Conjunction Notes Tuesday, September 6 th. Advanced Sentence Structure. 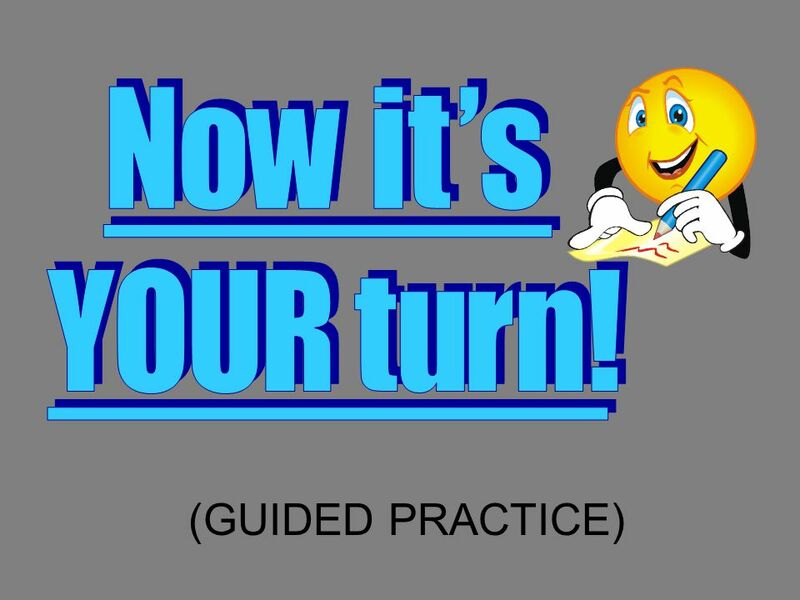 Clauses A subject and a predicate by themselves make an independent clause. 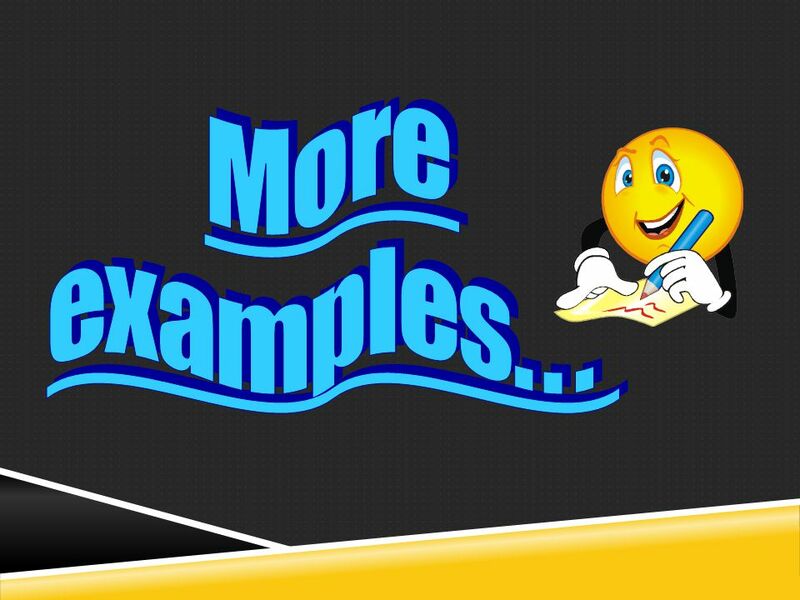 Sentences can contain more than one clause, and. 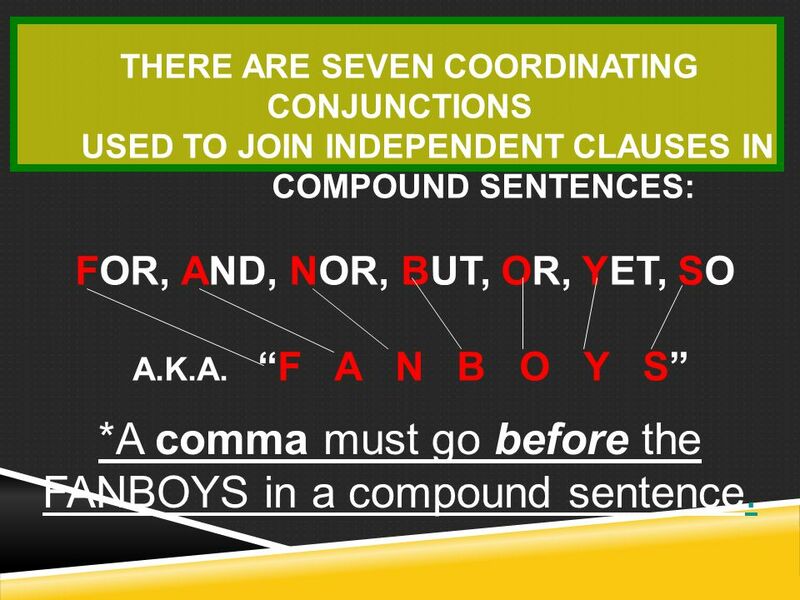 Coordinating Conjunctions Using FANBOYS to join independent clauses to form compound sentences.